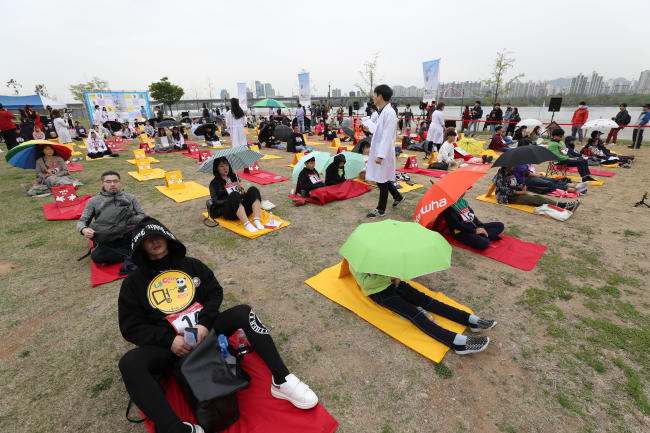 Despite the rainy weather on Sunday morning, about 150 contenders seen in the park stayed blank-faced for 90 minutes without talking, sleeping, eating or checking their phones. The contest rule is simple, a person who maintained the most stable heartbeat rate becomes the winner. The event aims to help people overcome their anxiousness of doing nothing, according to the organizer and performance artist Woopsyang. After the huge success of the first competition, which was held in Oct. 2014 in Seoul, a series of the contests took place in Beijing, Taipei, Hong Kong, Rotterdam and Suwon from 2015 to 2017 as well. The number of contenders also increased from 70 to 150 in 2018, and over 2700 people applied to take part in the contest. The participants were selected by various ages and occupations, the organizer said. Besides Lee, the jobs of contenders varied from housewife to politician. Participants who donned their uniforms were also spotted in the event, including a doctor in his white gown and a magician in a black suit. After 40 minutes the event started, contenders started to drop out from the competition. The trophy went to 14-year-old middle school student Yang Hee-won. “A teacher once corrected me for spacing out during class. I’m so happy today that I found what I’m good at (through the competition),” Yang said.